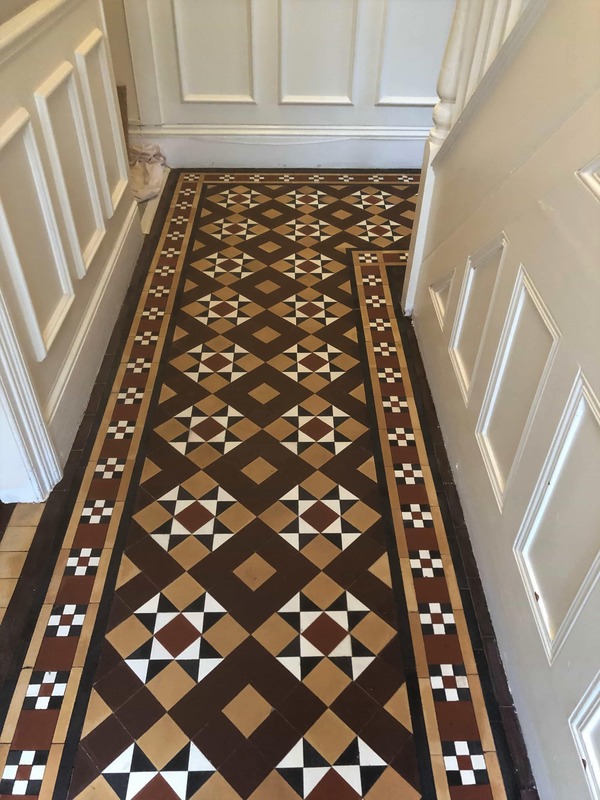 This customer bought an Edwardian property in Worcester and discovered a stained yet beautiful tiled period floor when removing the hallway carpet. 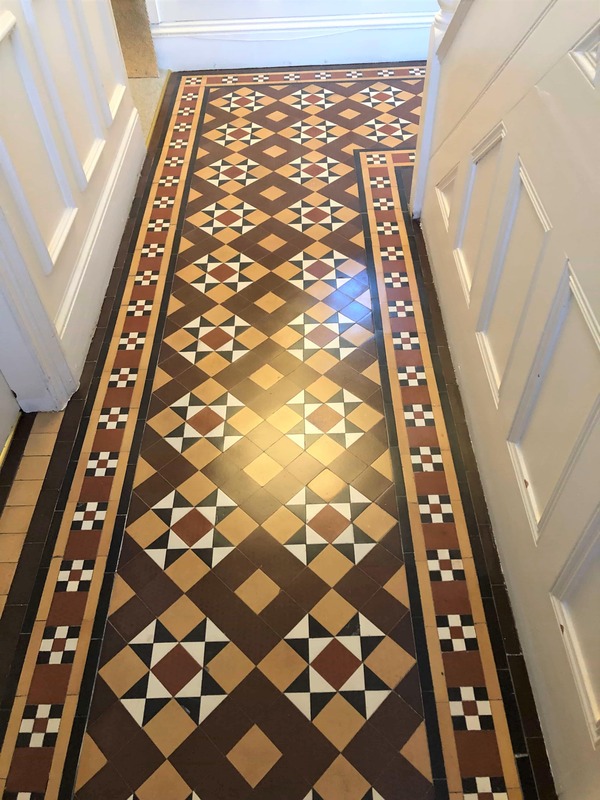 They were delighted to find the tiles were in good physical condition but as you would expect the floor needed a thorough clean and then sealing to protect the tiles and improve the finish. The property was well located, close to the city centre, River Severn and the stunning historic 12th century Worcester Cathedral. Neighbouring houses were of a similar age and it was lovely to see so many of them had retained their Edwardian tiled porchways. 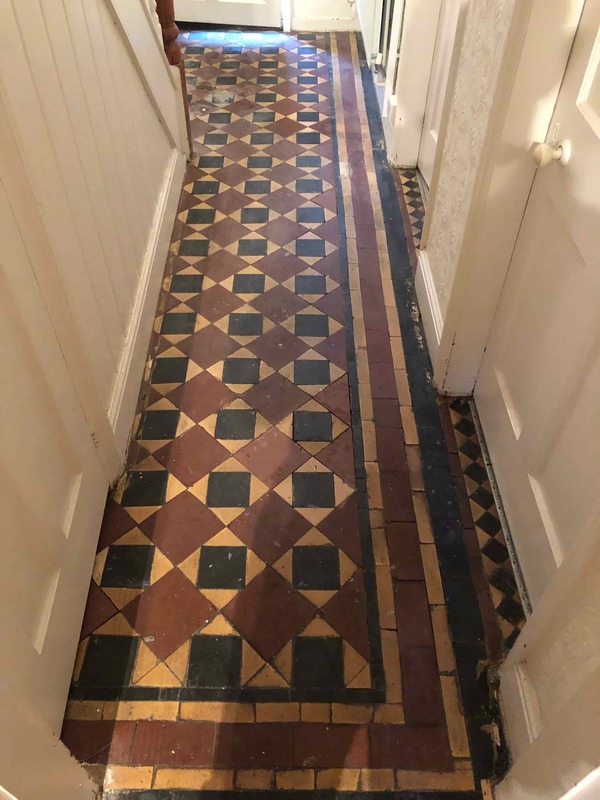 Naturally the new owners were keen to retain as many of the period features of the property as possible, and so over the moon to discover the original hallway. 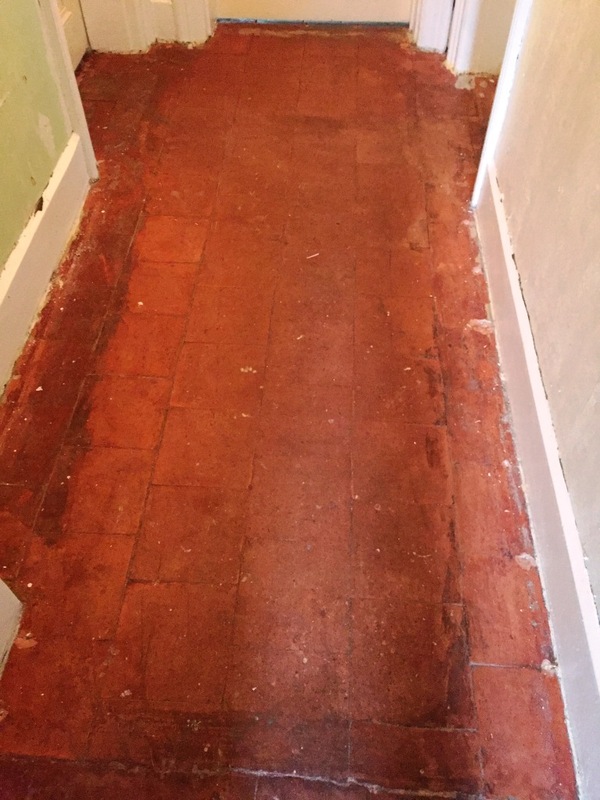 After popping round to survey the floor I discussed my plan for restoring the hallway and submitted a quote based on two days’ work. The quote was accepted, and the work was scheduled for later in the month. 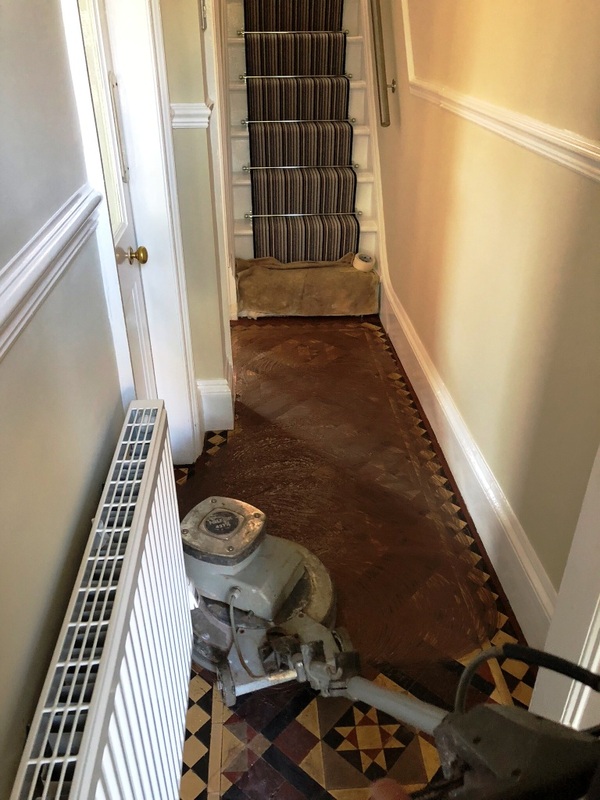 The first day was spent cleaning the floor, firstly removing the carpet glue which was quite heavy on the edges of the floor. I used Tile Doctor Remove and Go for this and ceramic hob scraper, sometimes the oddest tools are the best! 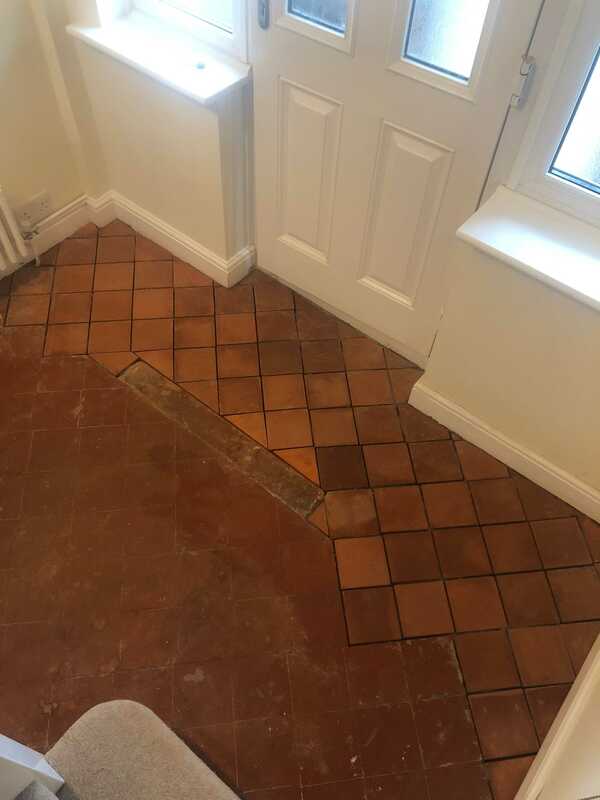 I then sprayed more Tile Doctor Remove and Go on to the remaining tiles leaving it to dwell for ten minutes. Then working the solution into the tiles with a 200-grit diamond pad fitted to my rotary scrubber, I really started to make some progress. 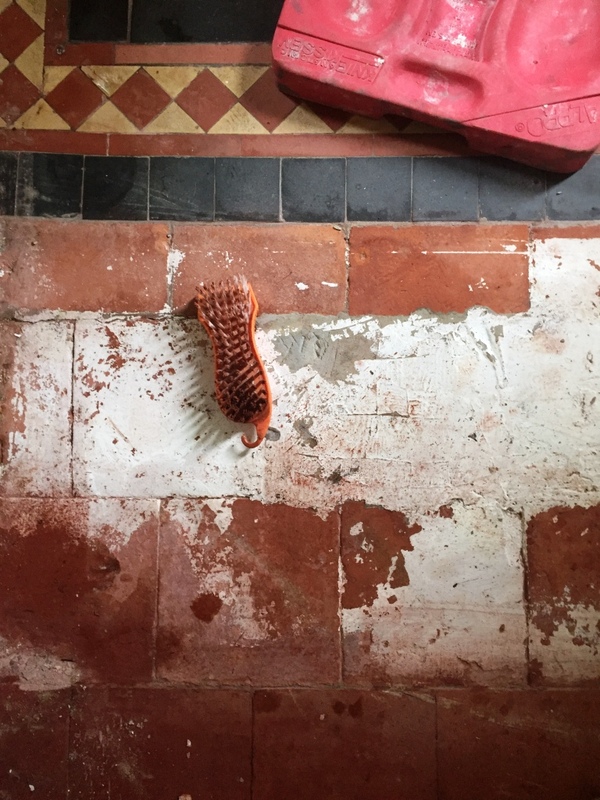 The soil generated was extracted with a wet vacuum and I made a start on giving the floor an acid wash. For this I applied Tile Doctor Acid Gel and pasted it onto the floor again working the gel into the tiles. 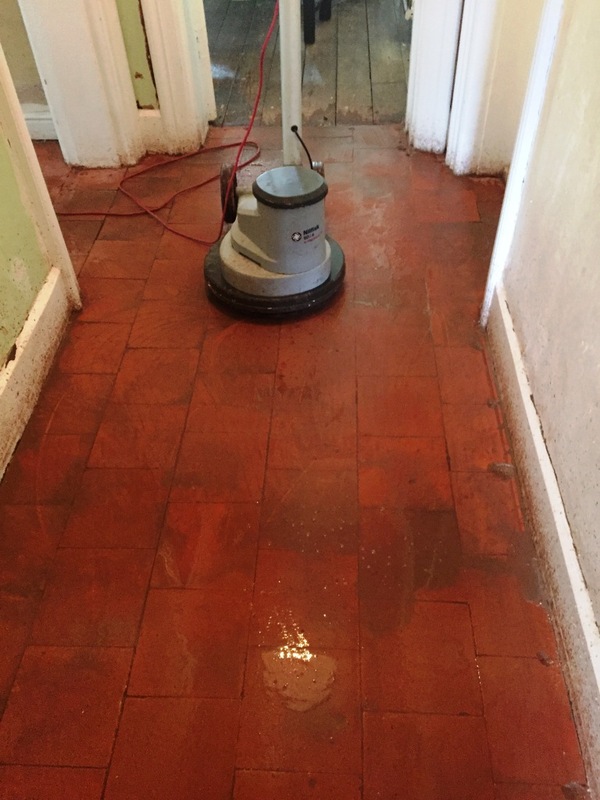 Tile Doctor Acid Gel is particularly useful for removing cement and grout smears. 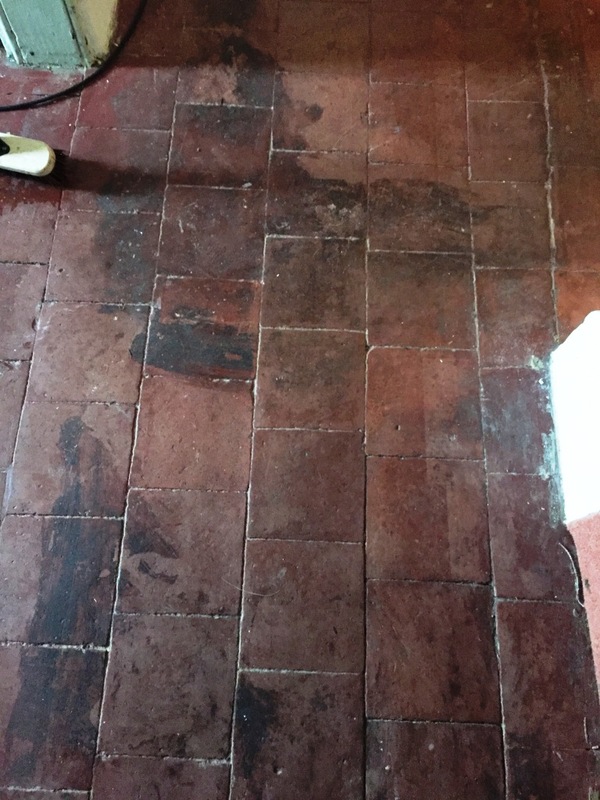 Also, there was some evidence of salt stains (Efflorescence), old floors like these don’t have a damp-proof membrane so it’s quite normal for moisture to rise through the tile. I removed the slurry with a heavy duty wet and dry vacuum cleaner. 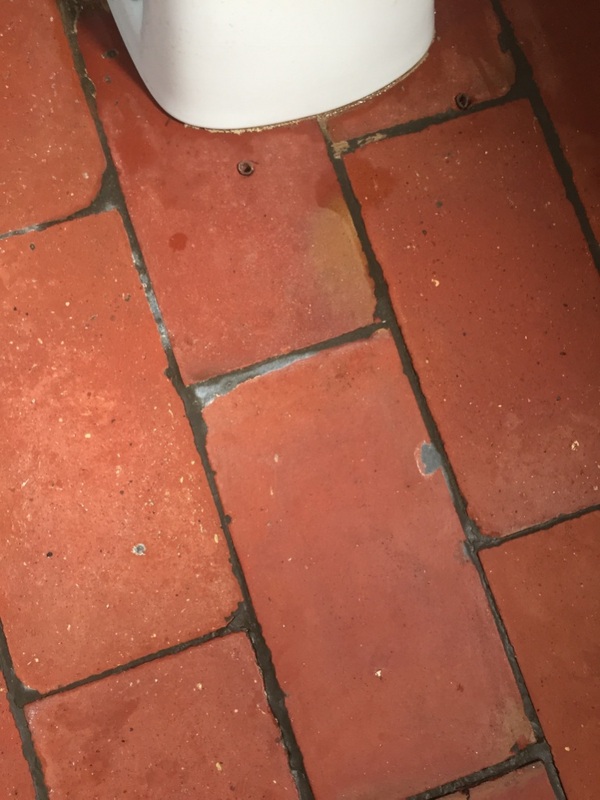 Then as a final measure I used micro fibre cloths and some Tile Doctor Grout Clean-up to remove any remaining smears once the floor was clean. I left for the day allowing the floor to dry overnight and would return the following day to seal. Returning the following morning, I first checked the floor with a moisture meter to ensure it had dried off fully overnight. The sealer I would use as agreed with the customer would be Tile Doctor Seal and Go Extra. This is a topical fully breathable semi-gloss sealer and would give a nice light sheen and allow the colours in the tile to shine through. This sealer is fully breathable and would cope well with the light efflorescence issues the floor had experienced in the past. The moisture readings were fine, so I started to apply the first coat of sealer using micro fibre cloths. After allowing the required drying time between coats I started on the second coat. Leaving the right amount of time between coats is especially important in winter when drying takes longer. 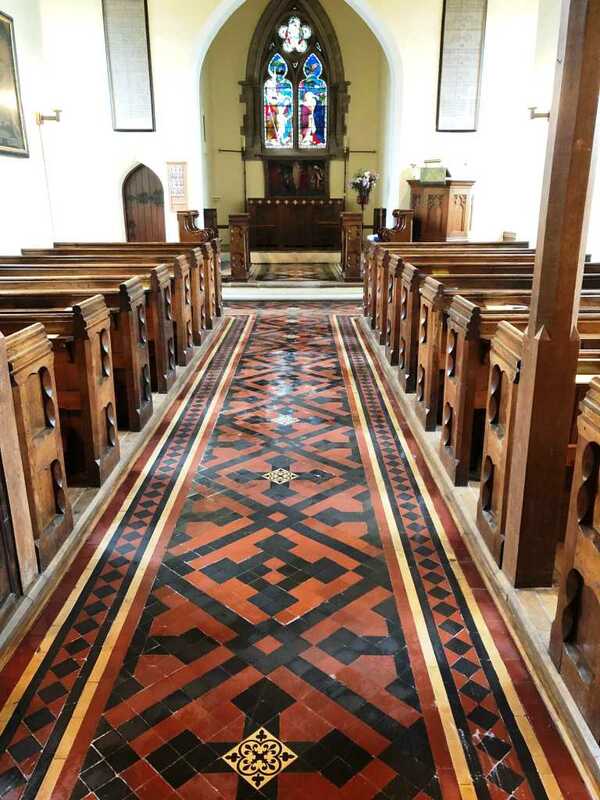 The floor was treated to five coats of sealer in total and the customer was very satisfied with the finish. 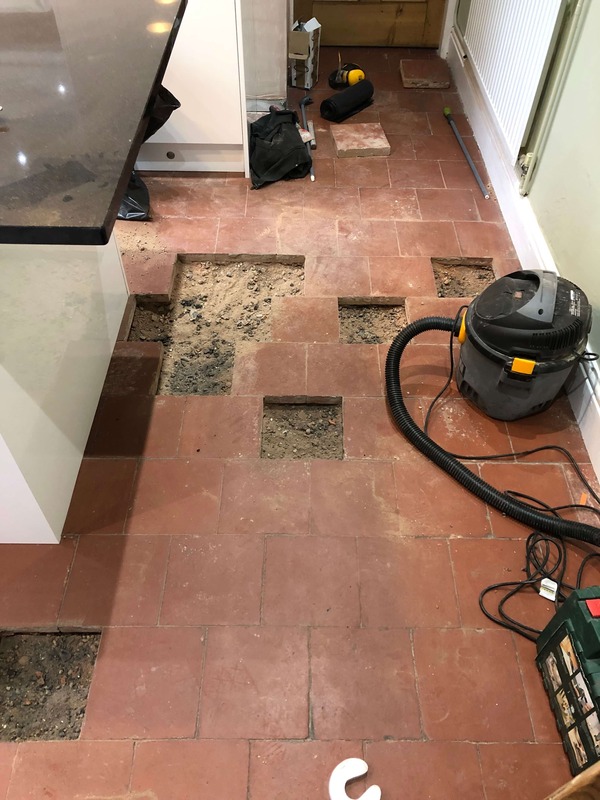 I was contacted to inspect a quarry tiled floor in the kitchen of a property in Droitwich Spa which was in need of repair and also in need of a clean and seal. 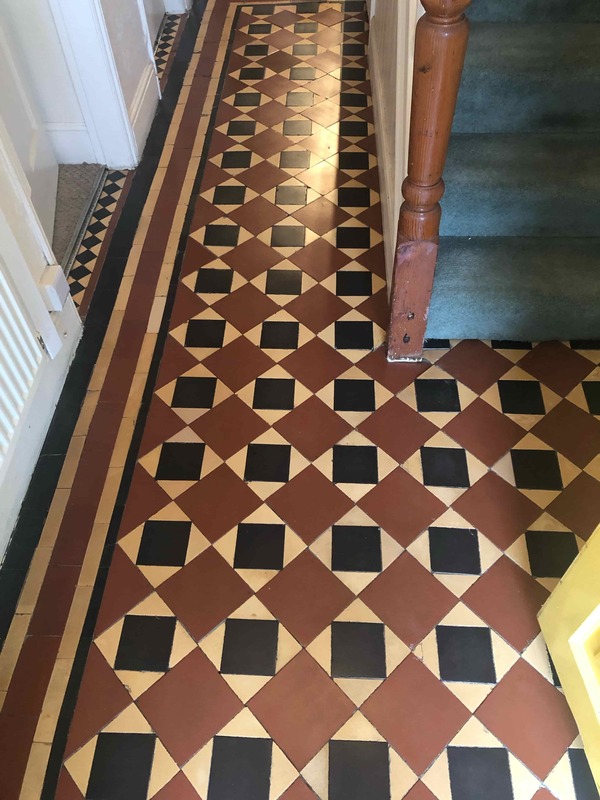 Having spoken to the customer previously, I was aware there were several damaged tiles that would need replacing so before visiting the property to survey the floor I sourced potential replacements from several manufacturers so I could find one that would be a good match to the originals. 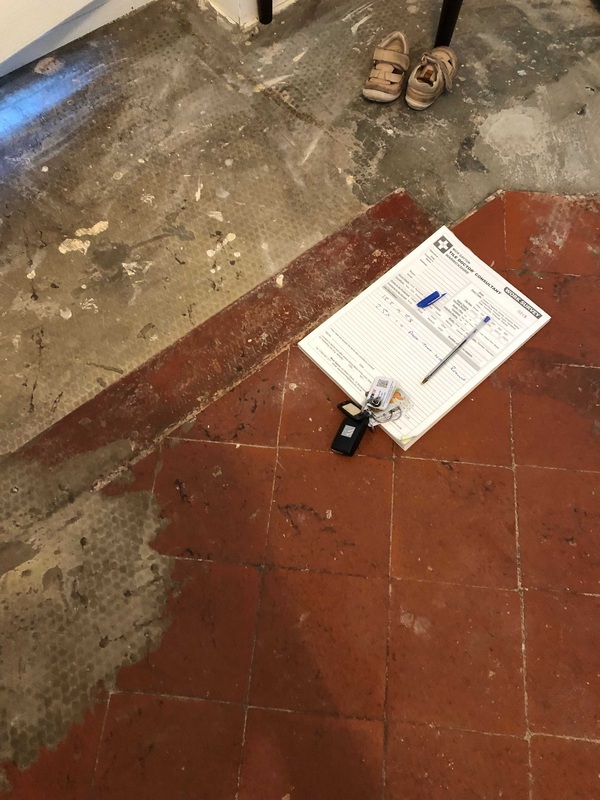 Once that was done, I went over with the samples to inspect the floor and whilst I was there marked all the damaged tiles that would need lifting and replacing. 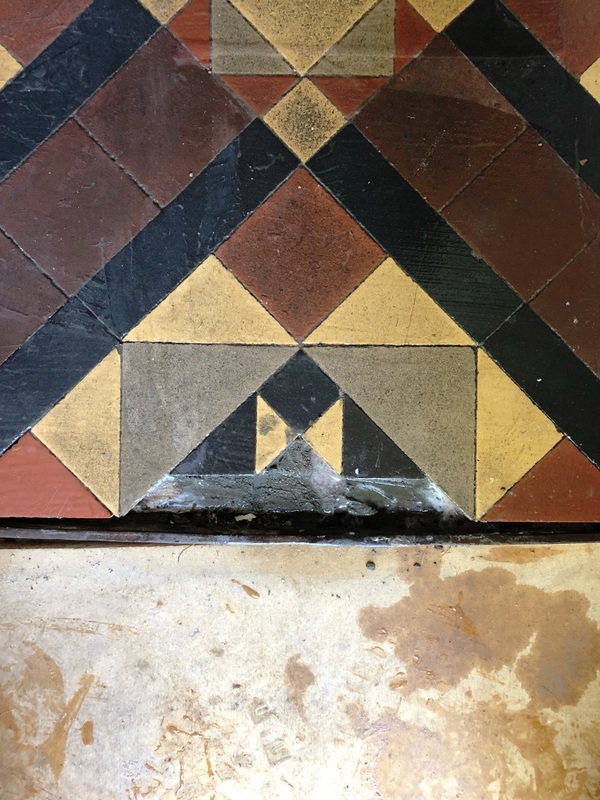 The house was quite old and many of the tiles had been badly affected by salt damage at some point in the past. 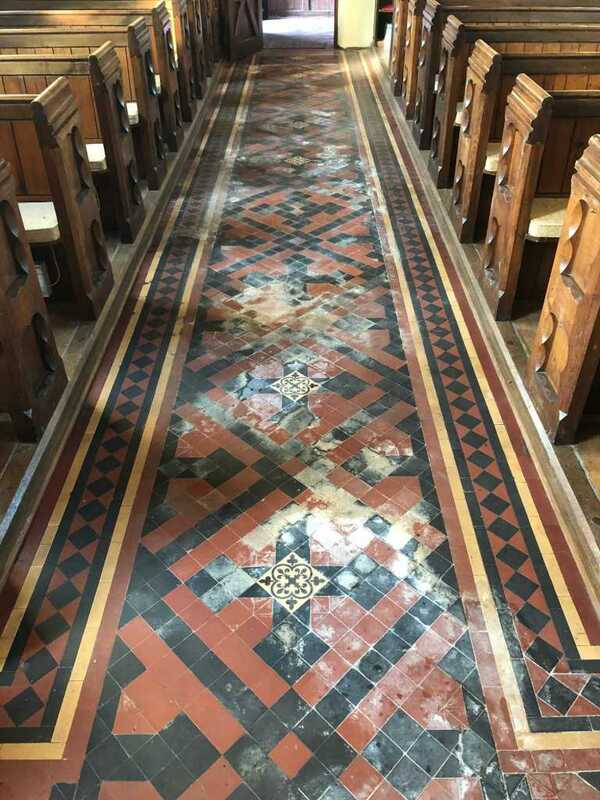 Given the age of the property it could have been from efflorescence or it is possible it was flood damage as the property was about 700m from the River Salwarpe which has a history of overflowing. In fact, Droitwich Spa is known for its salt deposits and became a Spa town when the salt industry started to dwindle towards the end of the 19th century. 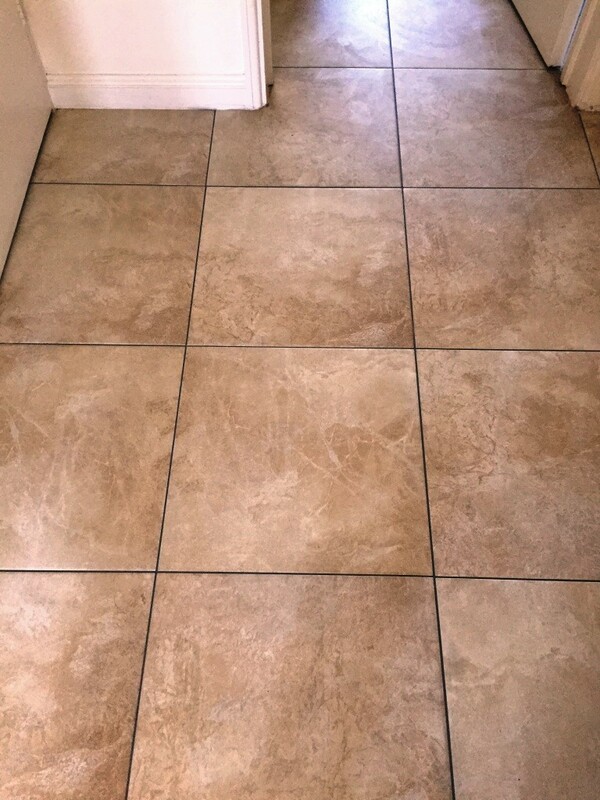 I worked out a quote to repair the floor, then clean and seal it which was accepted, and the work scheduled. 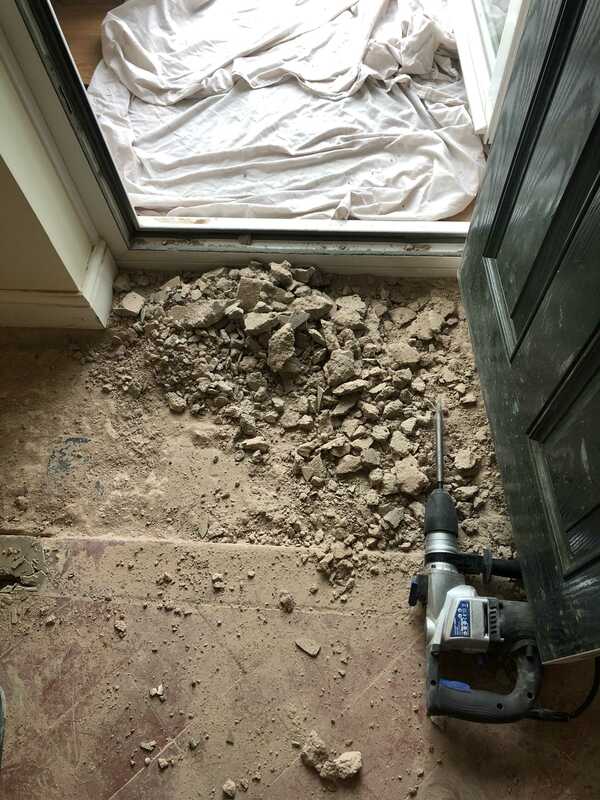 The first job was to remove the damaged tiles from the floor using various tools to prise the tiles away from the substrate. I then used a self-leveller to level the screed. 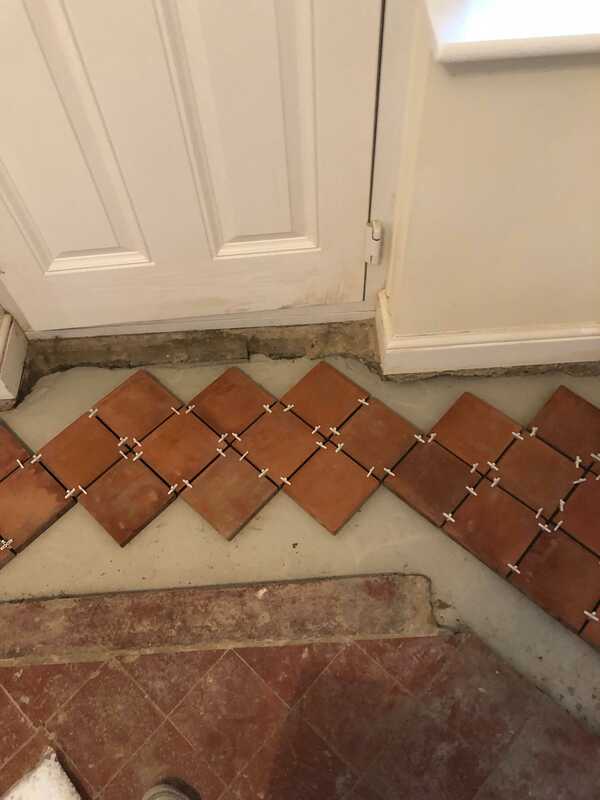 All the new tiles would need cutting so I used a Bridge Saw with a diamond blade and proceeded to cut all the tiles to shape. 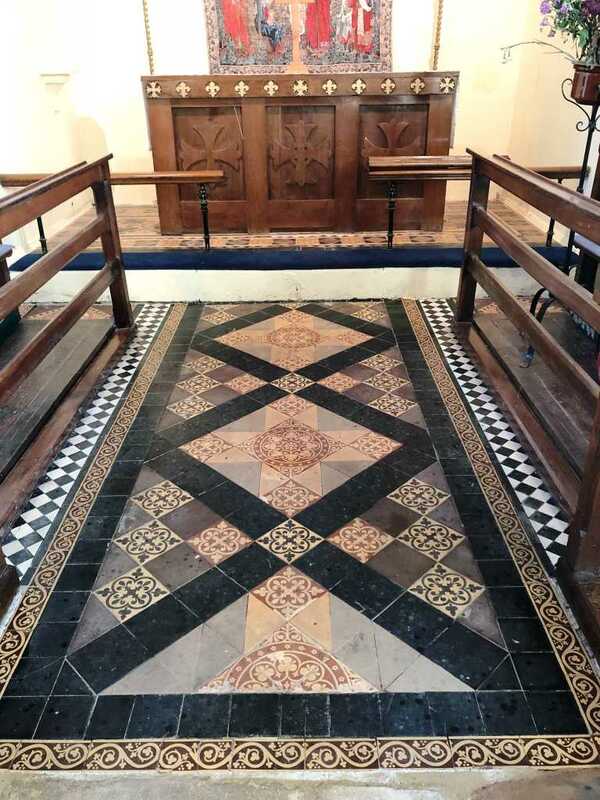 The replacement tiles were then fixed in place using flexible adhesive and left to dry and then grouted. The following day I moved onto cleaning the tiles. 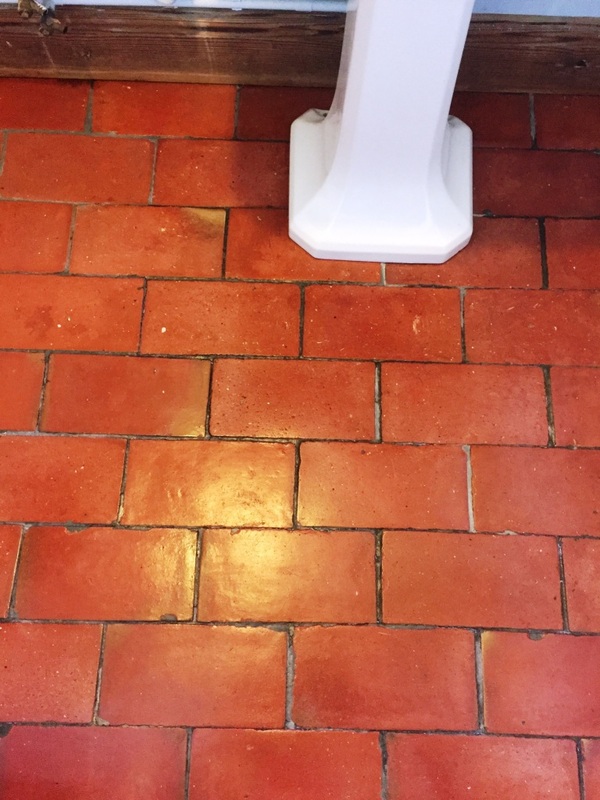 Tile Doctor Remove and Go was used to tackle any previous sealers. leaving the product to dwell for the required time and then working it into the floor with a rotary scrubbing machine. 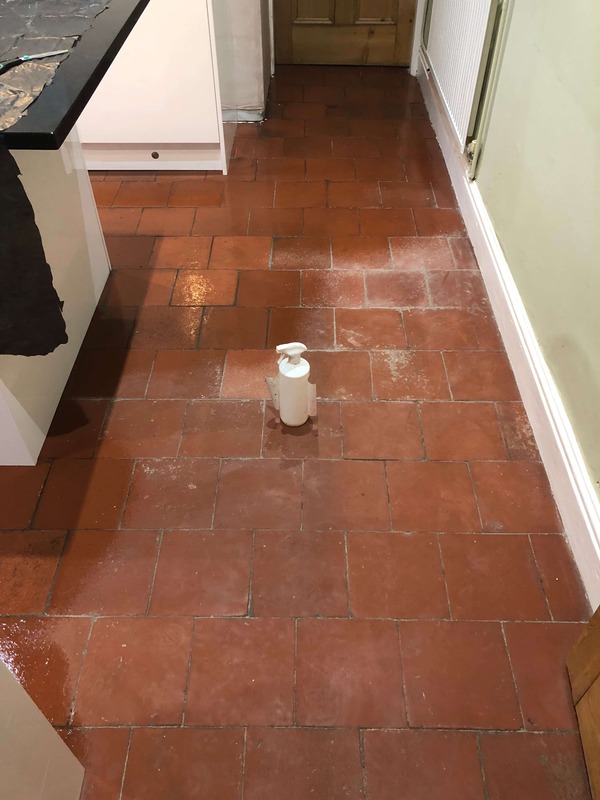 I then used Tile Doctor Acid Gel to remove old grout smears and combat any efflorescence the floor was encountering, before vacuuming the remaining slurry with a wet vacuum. 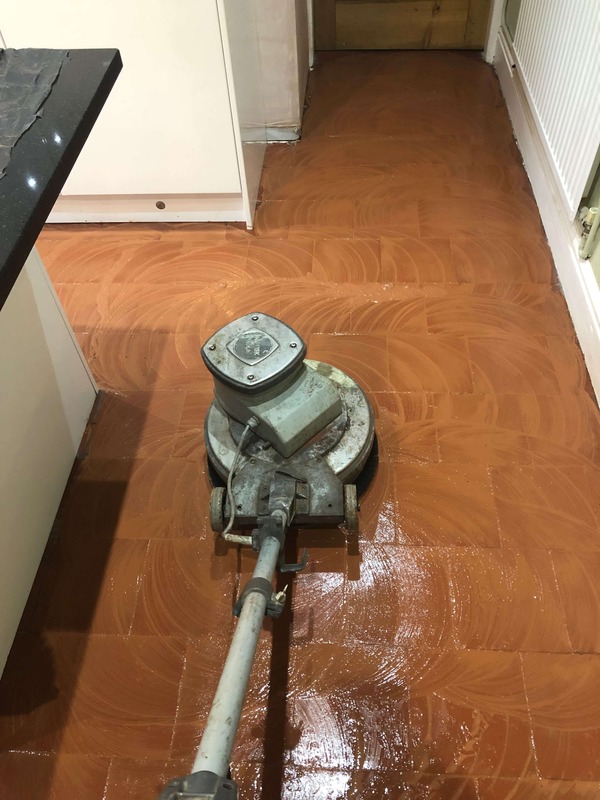 Once I was happy the floor was as clean as it could be, I left the tiles to dry overnight so they could be sealed the following day. 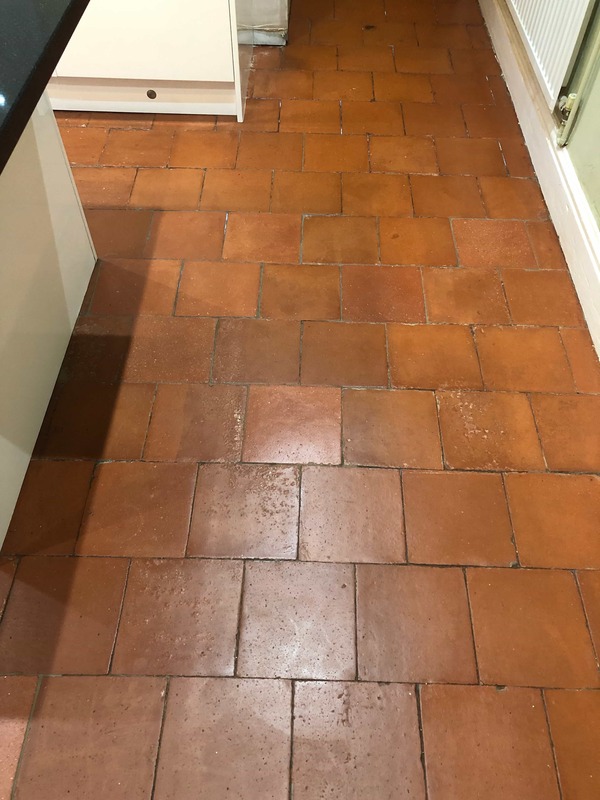 It’s not just major restoration work we do at Tile Doctor, sometimes a simple clean and seal is all that is required and that was the case at this property in Evesham. This medieval market town lies within the Vale of Evesham and is encompassed by the River Avon. It is located between the larger towns of Worcester, Cheltenham and Stratford-upon-Avon. 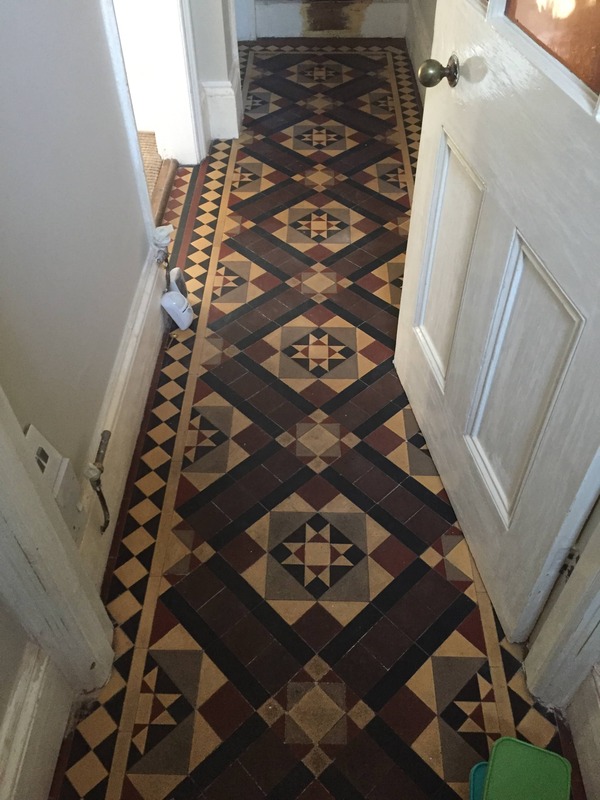 I was contacted by the owner and I arranged a visit to view their Victorian Hallway. 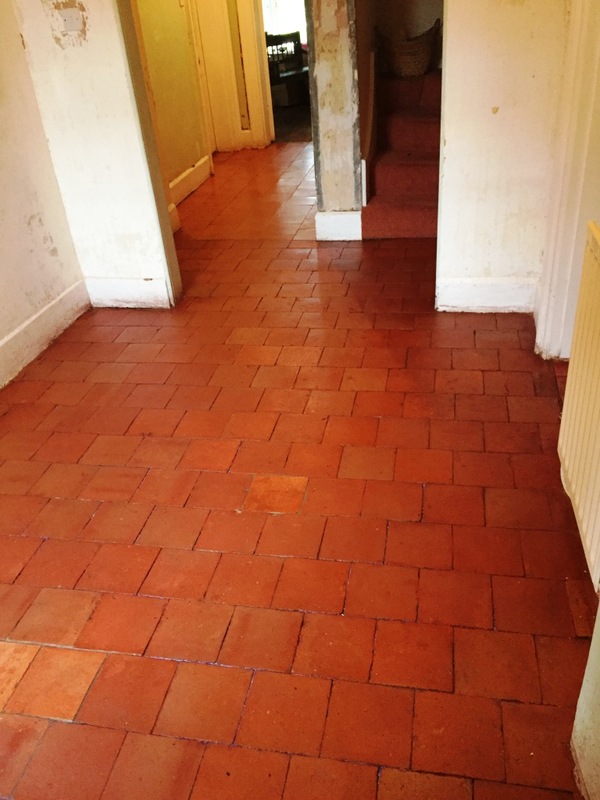 The floor was in very good condition, but the previous sealer was now in-effective and the floor was dull and needed a good clean and seal. The colours were starting to fade, and it was due some attention. 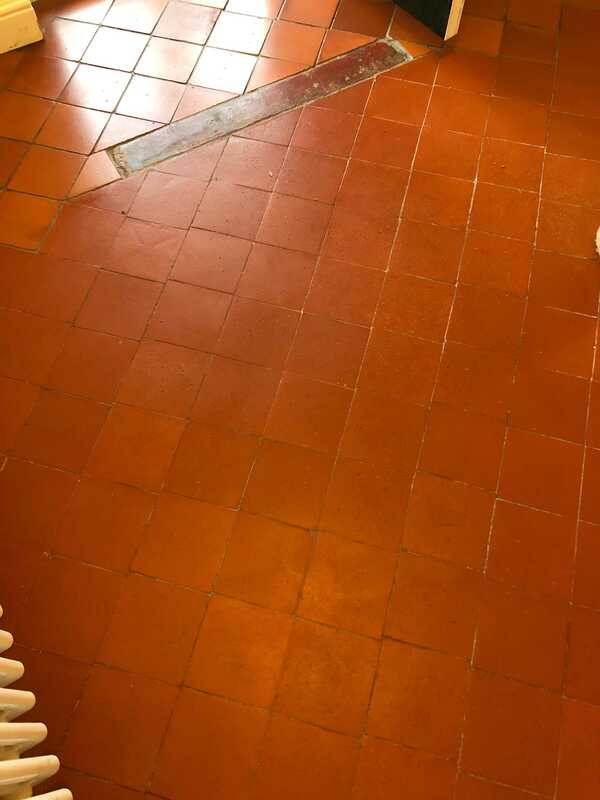 Sealers do wear off over time so if you have a similar floor to this it’s worth bearing that in mind. We discussed the work required and the cost involved, my quote was accepted, and the work scheduled. On arrival I set up my equipment and covered any areas of carpet to protect from splashing during cleaning. 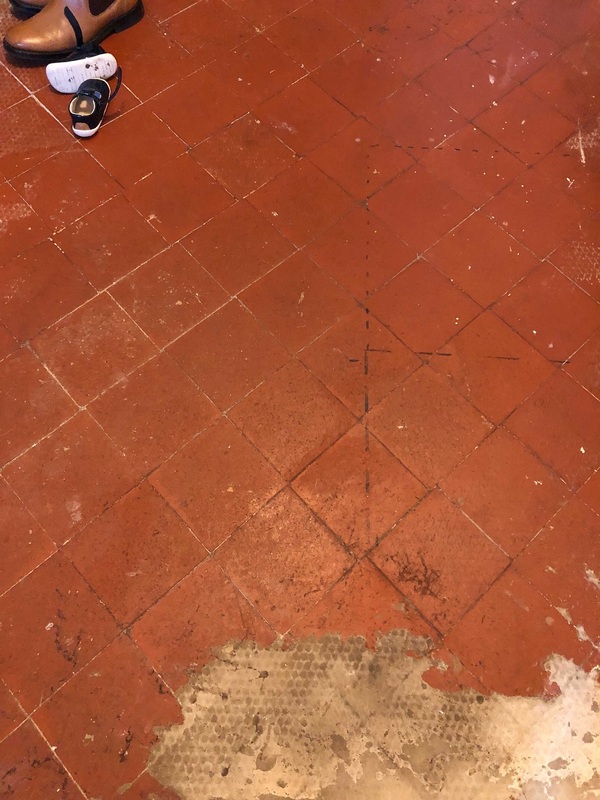 I then used Tile Doctor Remove and Go spraying the product onto the floor allowing it to dwell for 10 minutes thus breaking down any sealers. This product is a non-flammable, multi-purpose stripper which works best when left to soak in for some time before scrubbing. This product is also great for drawing out ingrained stains and removing heavy grease build up. 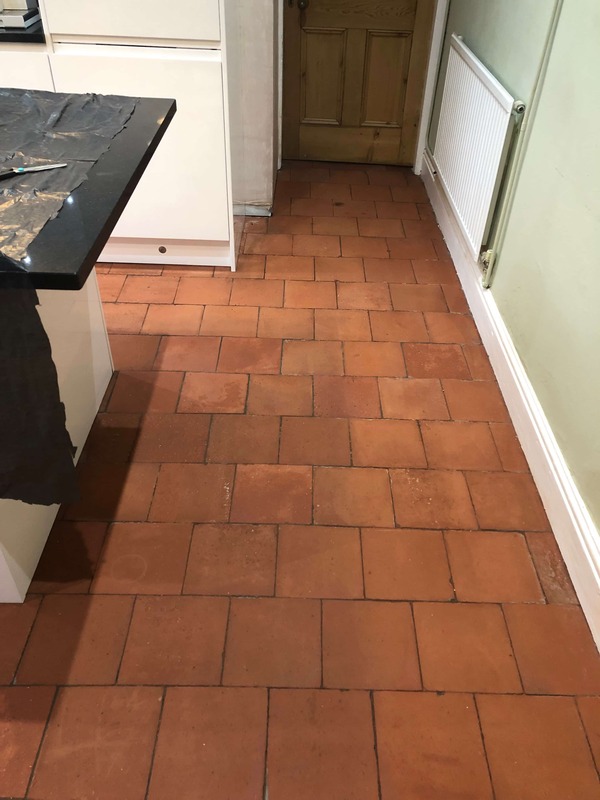 The floor was then pasted with Tile Doctor Acid Gel which works to neutralise any alkaline salts in the tiles that can cause efflorescence later. 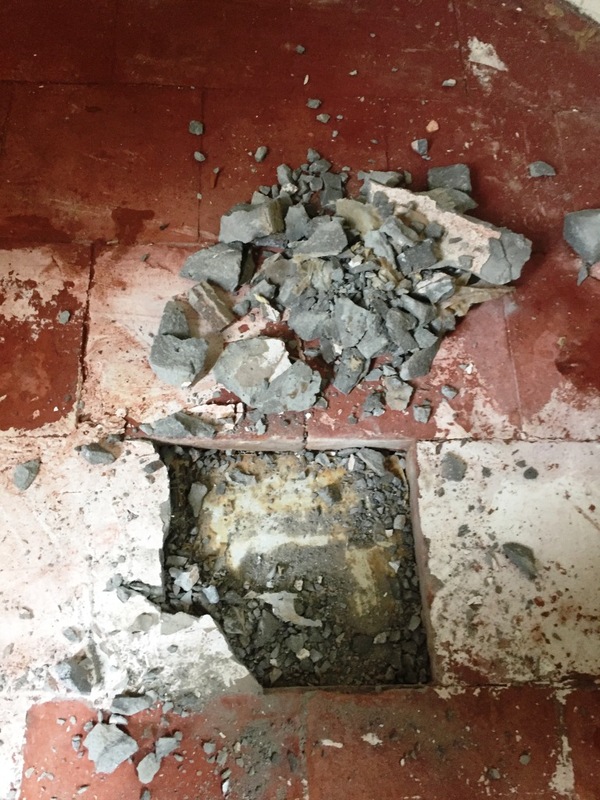 This is a common issue with old floors which often do not have a damp proof membrane in place. I then went to work with my scrubbing machine and a black pad and worked the products into the tile. The resulting slurry was then rinsed off with water and removed with a wet vacuum. I then went over the floor with microfibres and water to remove any remaining marks before leaving it to dry off overnight and ready for sealing. I returned the following day and started by checking the floor was dry using a moisture meter. 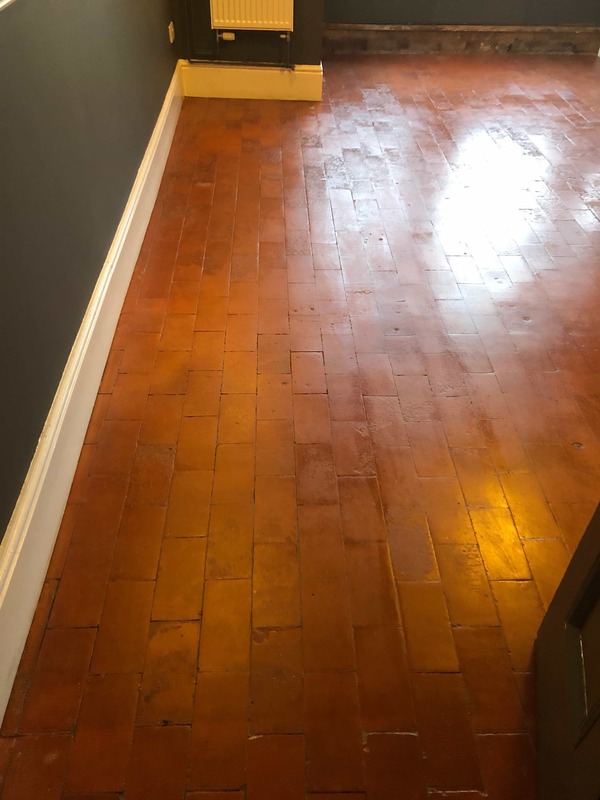 To seal the floor, I chose Tile Doctor Seal and Go Extra which is a fully breathable semi- gloss sealer which made a huge difference to the floor. 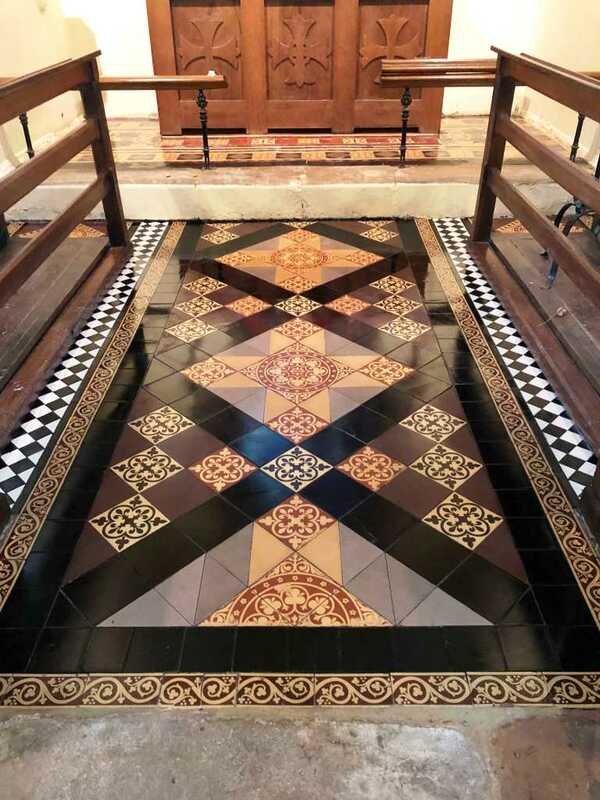 Choosing a fully breathable sealer is important for floors that don’t have a damp proof membrane as you want to encourage any dampness to rise through the tile and not get trapped underneath where it might spread into the walls. 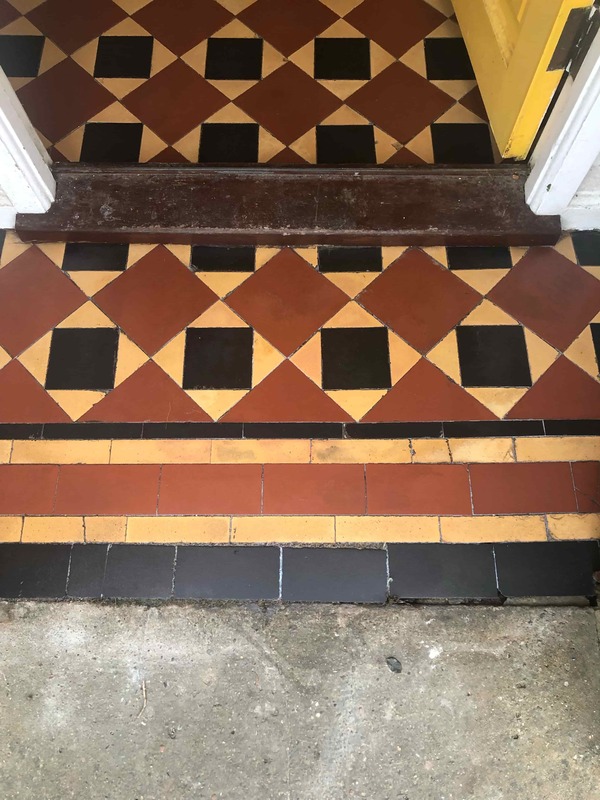 The deep clean and new seal brought out the vibrant colours in the tiles which were now shining through enhances by the lovely sheen which customer was very pleased with. 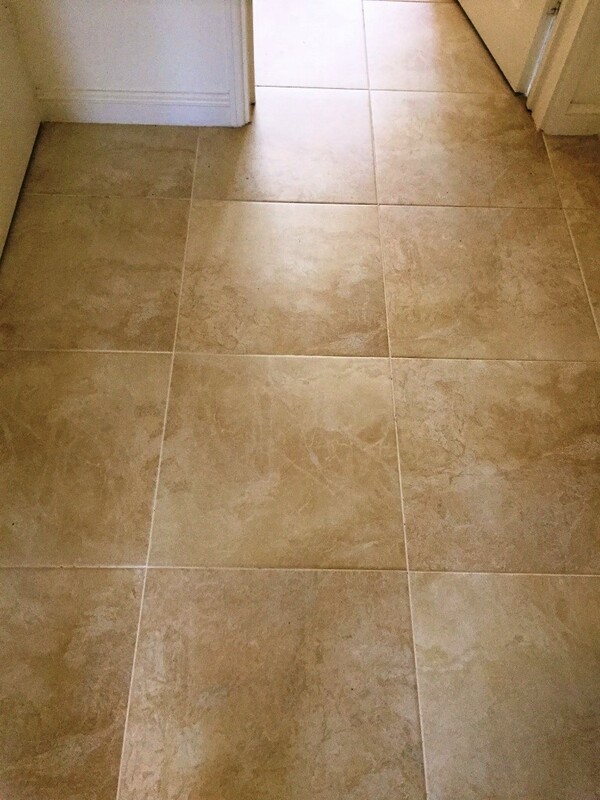 For aftercare I left the customer with a bottle of Tile Doctor Neutral Tile Cleaner which being concentrated goes a long way. Once diluted with water the product becomes completely pH neutral which unlike most household cleaners and washing up liquids which contain bleaches won’t prematurely degrade the sealer with use. 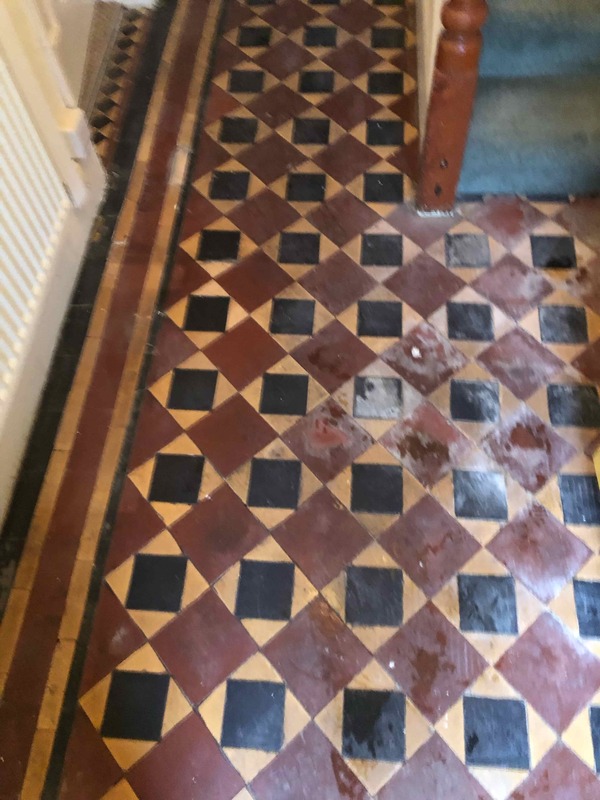 I received an enquiry for a clean and seal on this Victorian tiled floor in Worcester, so having spoken to the customer on the phone I arranged a time to make on-site visit to survey the floor and get a good look at the requirements, so I could advise on the cost. 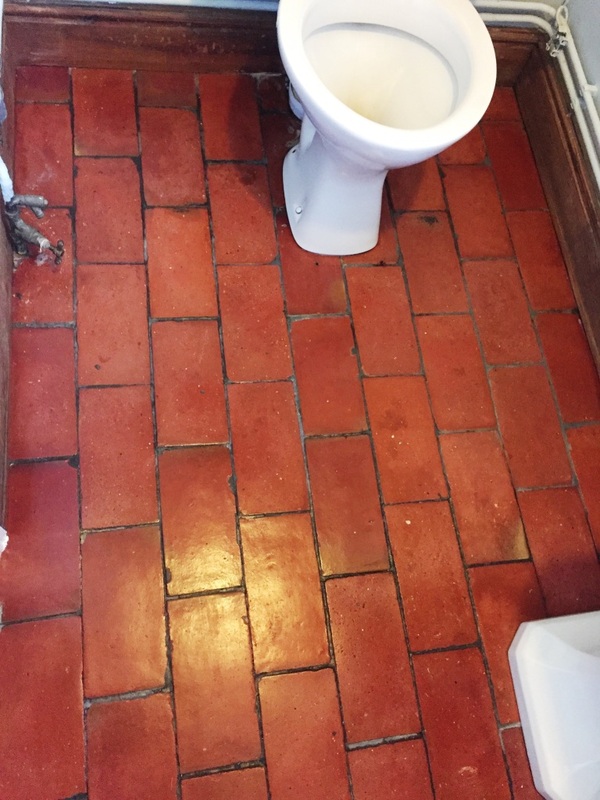 On inspection I could see that not only was the floor pretty dirty, there was also an area of missing tiles. 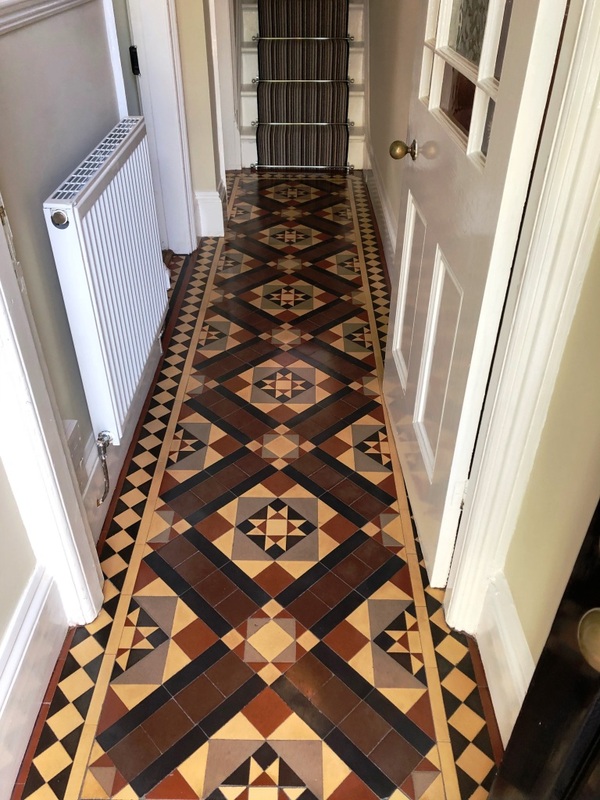 I managed to trace the tiles to Craven Dunnill a high-quality Victorian floor manufacturer based in nearby Bridgnorth that have been in business since 1872. Thankfully I knew I was able to source some more for them which would match nicely. 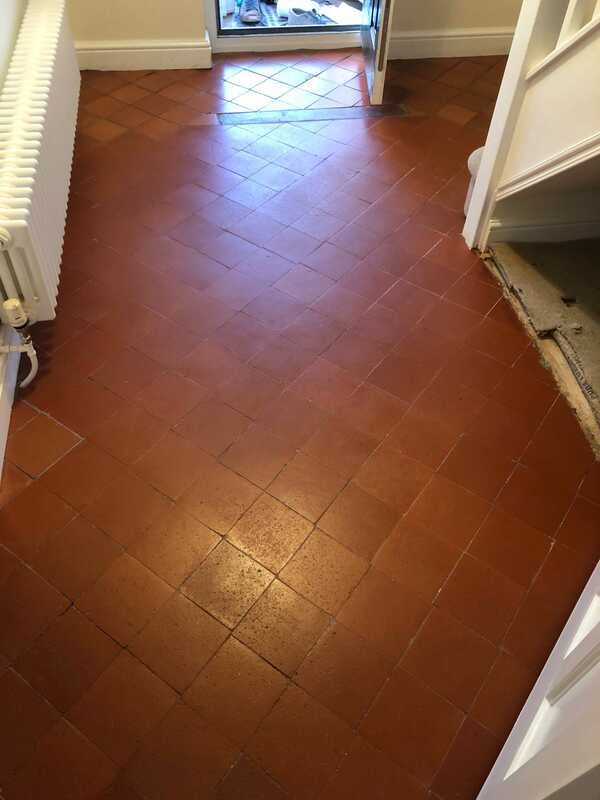 The owner of the property was delighted to hear that not only would we clean the floor, but we could also source, supply and fit replacement tiles thus making the floor complete again. 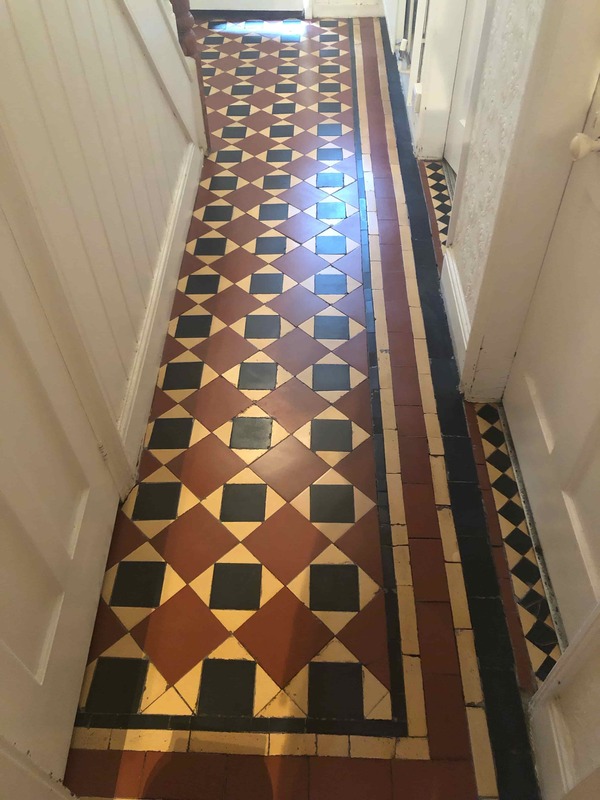 After visiting the property, I sent the customer an accurate quote for the repairs and to clean and seal the hallway floor. They were happy with the price and my quote was accepted and a date arranged to complete the work. On arrival the first step was to set up my equipment including a rotary floor scrubber/polisher, a wet and dry vacuum and my tile cutter. I started with the floor edges first as they are difficult for floor machines to get into effectively. The process involved spraying the edges with Tile Doctor Remove and Go and then scrubbing it in with a a handheld diamond burnishing block. I then sprayed the rest of the floor with more Remove and Go and left it to dwell for ten minutes. I then proceeded to work the product into the floor with the rotary machine fitted with a black scrubbing pad. 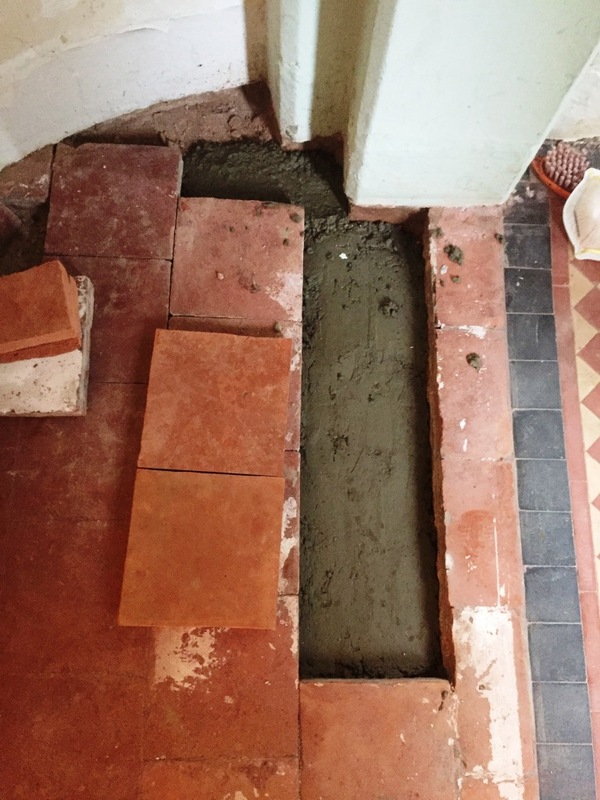 The floor was then rinsed with water and the soil extracted using a wet vacuum. 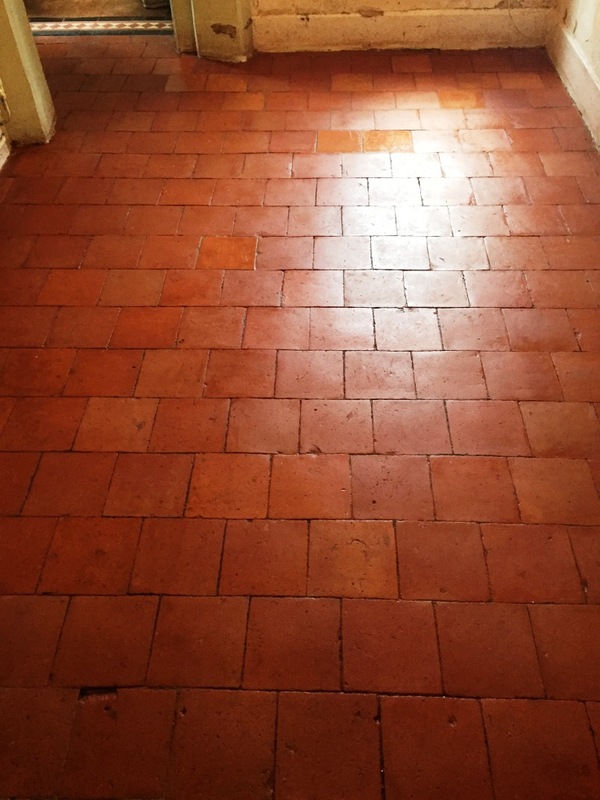 My next step was to give the tiles an acid wash by scrubbing Tile Doctor Acid Gel into the floor effectively repeating the previous process. 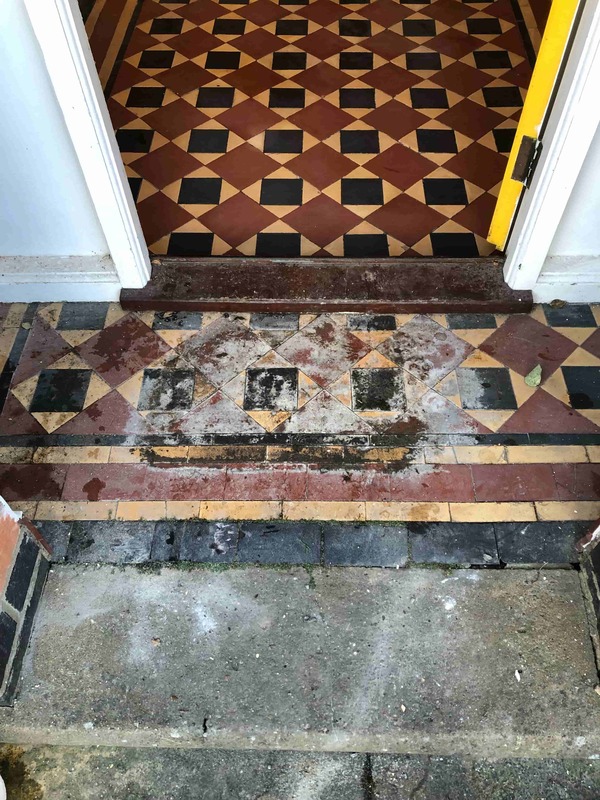 The Tile Doctor Acid Gel is especially effective on Victorian floor tiles to remove mineral salt deposits (efflorescence) and old grout smears. Once I was done the soil was rinsed off as before and extracted with a wet vacuum. 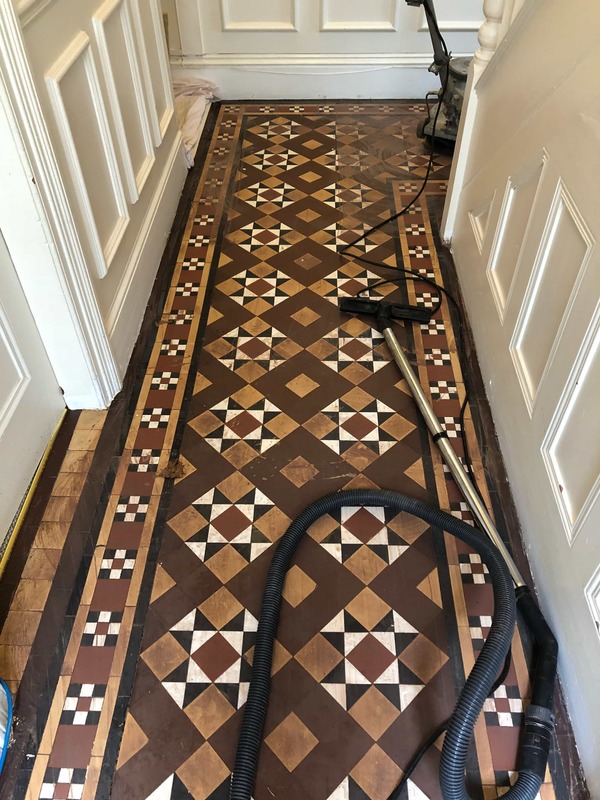 Once I was happy the floor was clean, I moved onto the repairs, carefully measuring and cutting the shapes and fixing the tiles into the gaps with rapid set adhesive. 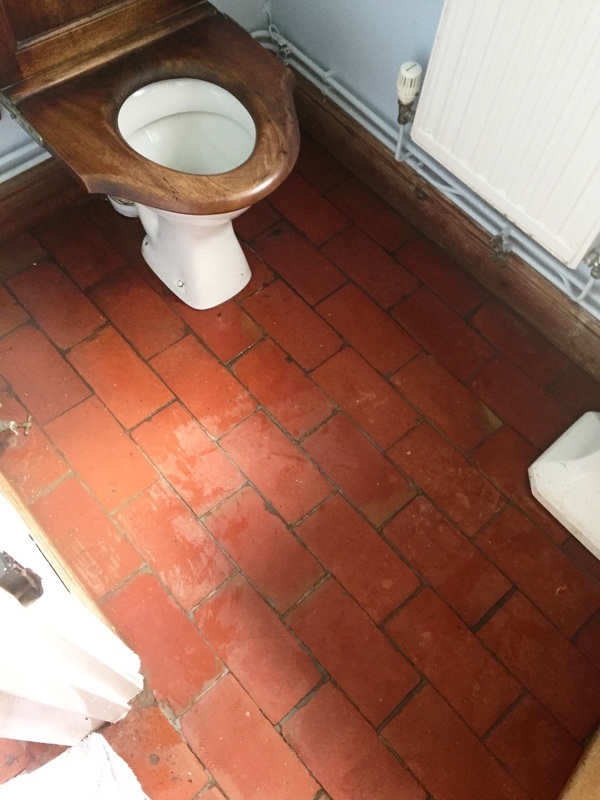 I then grouted the area and left the tiles and floor to dry for the rest of the day and would return the following day to seal. I returned the next day and after checking the floor was dry with a moisture meter, I started with sealing. 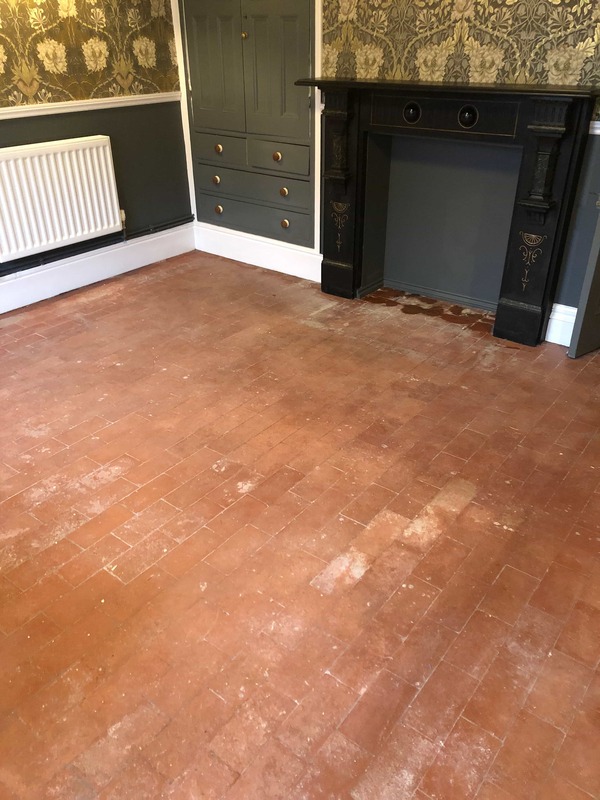 The product I used was Tile Doctor Seal and Go Extra, this is a fully breathable sealer with a semi-gloss finish which is ideal for old floors like these that won’t have a damp proof membrane installed. 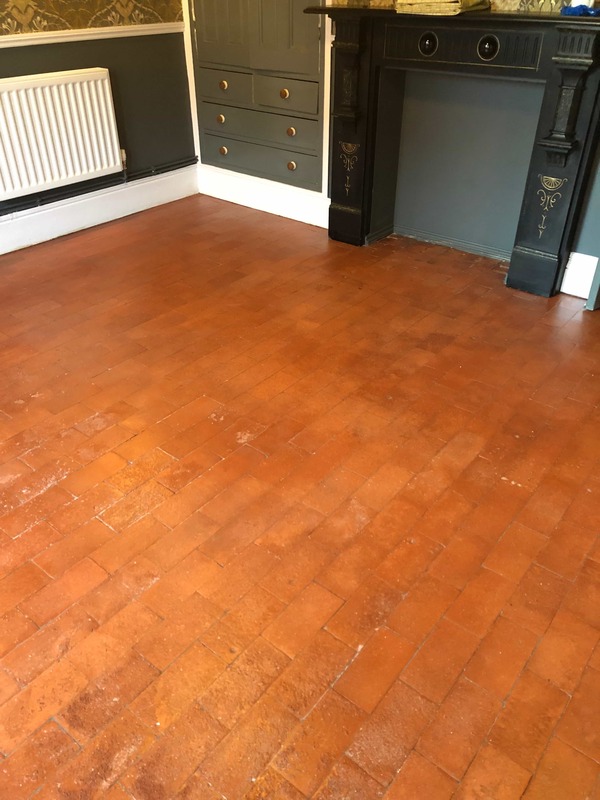 I worked the product into the floor leaving 30 minutes between coats and treated the floor to four coats before I was happy the floor was completely sealed. 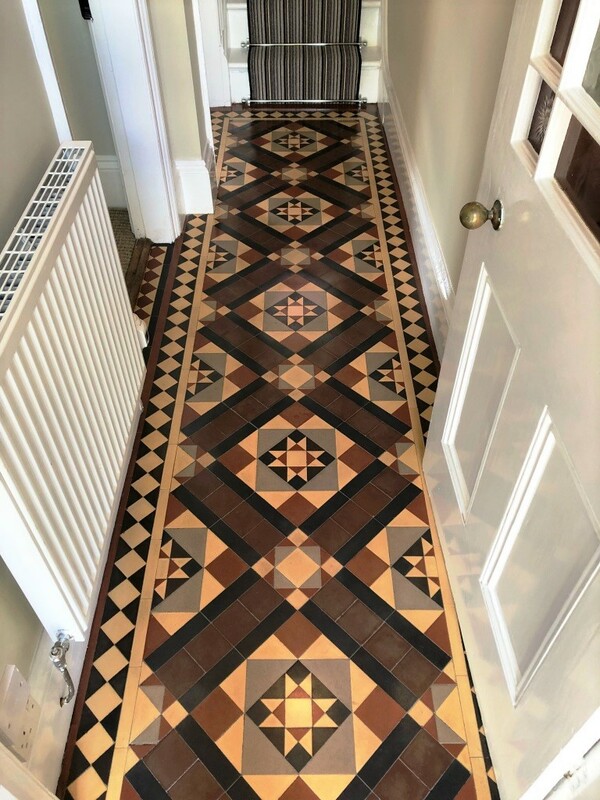 The customer was very happy with the finished floor and left some great feedback (see below) and has been asked by family and neighbours for our details.